Healthy green smoothies aren’t a new years resolution for me as you may have seen by now, it’s a lifestyle. I’ve made many changes in my life over the past year and making a dedication to green smoothies for myself is a big one. While I’ve been drinking them for years, I now drink one everyday in one way or another. It comes for breakfast mostly, sometimes with a pastry, mostly not though. If it’s the weekend and we choose to go out for breakfast I know I’ll be having one for a snack or as my lunch later in the day. It’s simply a choice I’ve made to ensure I’m getting extra nutrients my body needs to be super awesome! Easy peasy! But with so many smoothies being enjoyed around our house, I needed inspiration for new ingredients. We all need inspiration right? So I went to my trusty Instagram page and searched for green smoothies, I was totally inspired in so many ways. 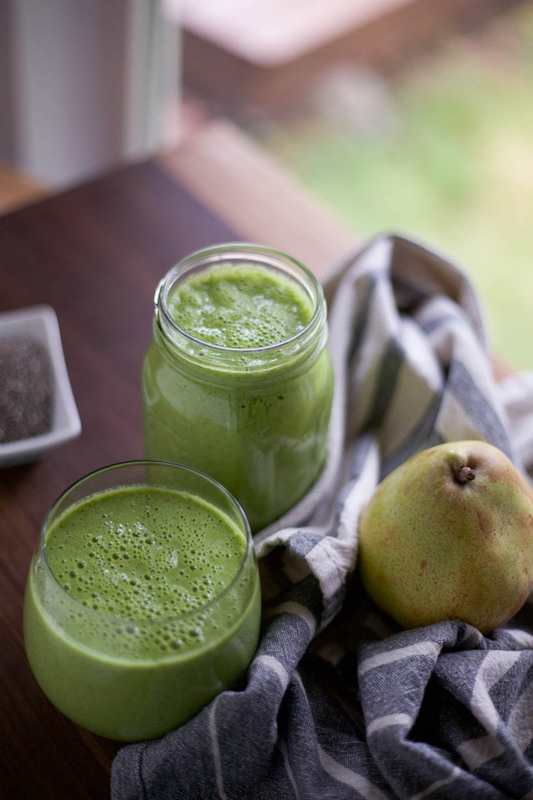 The first inspiration is this Pear Chia Seed Green Smoothie! 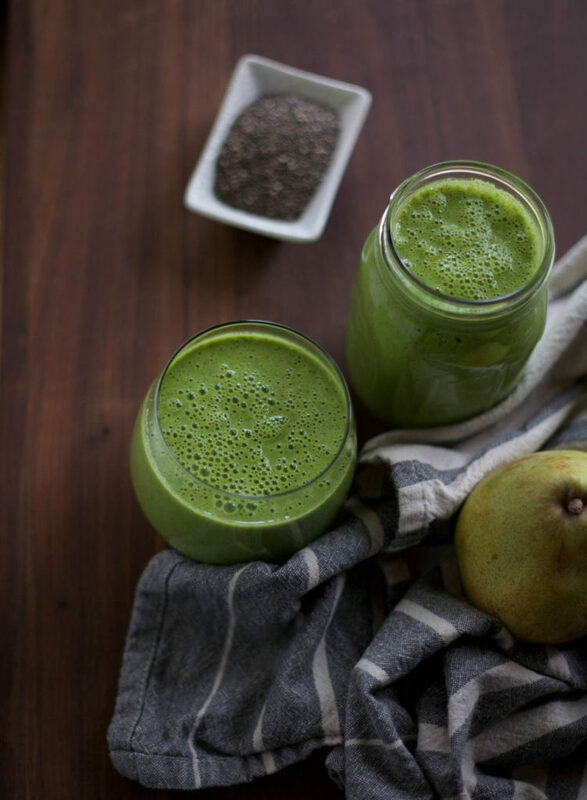 I’ve not added to pear in a long time and changing the ingredients in smoothies is important to give your body different nutrients on a weekly basis. I always keep add in for smoothies to up their nutritional value like apple cider vinegar, spirulina powder, hemp seeds, and now chia. I took a break a while ago on add ins, but I’m back and feeling better than I ever have in my life so far. It could be the daily positive talking, gratitude giving, and yoga too. But it really is a combination of all of it, yoga is at the top though. 🙂 Moving my body in yoga and the green smoothie has given me more energy and happiness than I have ever had, so that it super cool. 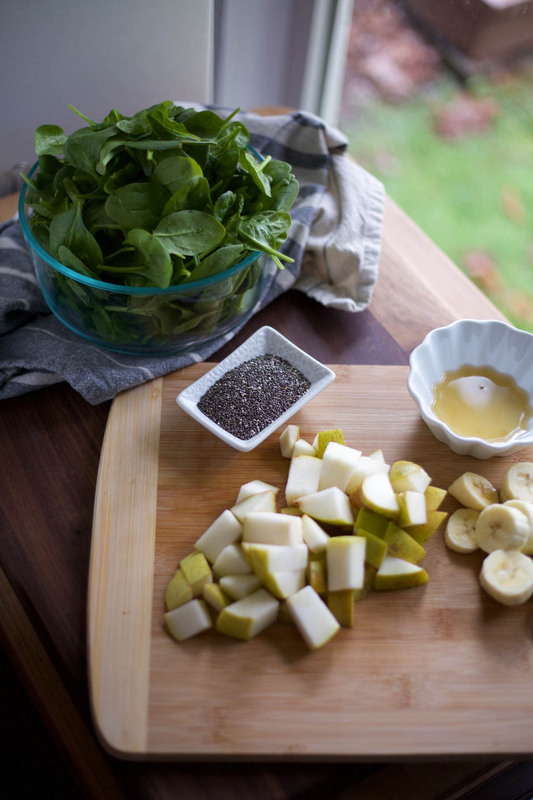 Use whatever pear you love, greens you love, and add ins! Make it taste good so actually want to drink it, that’s the key. Instead of coffee, give a green smoothie and glass of water a try for that afternoon pick me up, it works! Place all ingredients in the order above in a blender, blend on high for a few minutes until blended well. Serve immediately or store in a glass with airtight lid for next morning. Inspiration and recipes for our health!